Tucked away into the Wasatch Mountain Range, Park City is a nexus point for over 400 miles of trails for you to explore. Whether you have a vacation home in Park City or are just visiting, you can use our Park City hiking guide to learn everything you need to know about hiking in this beautiful area. There are so many fantastic trails for you to try while hiking in Park City. To help narrow the list, we chose ten trails that are especially scenic, easy-to-access, and mild-to-moderate difficulty. Lambs Canyon Trail – About 3.5 miles roundtrip, you will gain around 1,400 ft of elevation on this mountainous hike. Spring and summer are particularly beautiful times to do this hike as you will find fields of wildflowers and full-leafed aspens. Hat Trick Trail – Roundtrip, the Hat Trick Trail is 2.6 miles long. You can use this trail to connect with other Round Valley trails like Fastpitch, Fairway Hills, and Ability Way trail. Iron Canyon Trail – Great for birding while hiking, this two-mile out-and-back trail will take you out in nature and into the beautiful canyons in Park City. Run-A-Muk – A year-round, 2-mile trail, you can take the whole family including the dog on this hike. Just below Utah Olympic Park, everyone can enjoy a rambling, easy hike on Run-A-Muk. Spiro Trail – Moderately difficult, this trail is popular with hikers and bikers. You can climb up several switchbacks during this 8-mile loop and enjoy traveling through wildflowers and aspens. Jenni’s Trail – Still a relatively new pathway, on Jenni’s Trail you can encounter wildlife as you wander through various groves of trees. It is moderately difficult and is 4.7 miles long. You can also pick up a ZipRider ticket and zip line back down the mountain rather than return hike. Shadow Lake Trail – Combining with the Jupiter Peak Trail, you can enjoy a quiet hike to a less populated lake. This hike is 5.1 miles long and is a loop trail with moderate difficulty. Glenwild Loop – This trail is a loop of 8.5 miles and accessible from the Spring Creek Trailhead. There are some steep climbs to add extra difficulty to this beautiful, singletrack hiking trail. Fantasy Ridge – Make no mistake, this six-mile hike will be difficult nearly the entire time. This trail follows through the lovely aspen groves along the ridgeline up to the Canyons Resort 9,900 ft peak. The grueling effort is well-worth the stunning views of the Park City valley and surrounding mountains. Millennium Trail – A lengthy, paved trail which is 7.5 miles long and connects to other trails and bike paths. It is not far into nature but still allows you to experience the beauty of the Wasatch Mountains. While our top ten list covers the all-around best trails to check out in Park City, there are many other great trails out there. Depending on what you are looking for in a trail, we found some excellent trails for family hikers, extra-long hikes, and more. Farm Trail – A simple 1.4-mile hike, the path is paved with some easy rolling inclines for children to burn their energy on. Summit Park Over Easy – A shady 2.5-mile out-and-back hike you can bring the whole family on. The trail will wind through picturesque alpine meadows and pine forests. Silver Lake Trail – As a foot-traffic-only trail, this area is quieter than some other hikes. You can ride the Sterling Express chairlift up, then enjoy the downward hike or trail run. Also, if you hike up, you can take the chairlift down for free. Loose Moose Trail – A downhill-only hike, you can reach this trail by riding up the Payday chairlift. While this particular trail is about a mile long, it connects to trails like Crescent Mine Grade and Jenni’s Trail. McLeod Creek Trail – A gentle, paved trail so you can take strollers, dogs and young children. It is four miles of winding trail near water and rolling pastures. Willow Creek Trail – A mix of packed dirt and paving, this two-mile loop goes around a pond, various playgrounds, and a picnic pavilion where you can stop and enjoy a mid-hike picnic. Swaner Nature Preserve Trail – Rather than just one trail, the Swaner Nature Preserve has a system of four trails for a 10-mile long hike. These trails are a mixture of gravel, paving, and boardwalks so you can enjoy full immersion in the preserve. Historic Union Pacific Rail Trail – While this trail is 28 miles long, people of all ages can join in on this hike. It is a paved/gravel hike, which follows along a former railroad track with great views of Park City and Deer Valley resorts. To stay safe as you revel in nature, there are some things you should make sure you bring on any hike you try in Park City. Water – If you don’t remember anything else, remember to bring water as you hike. A 24-ounce bottle will help you through most hikes, though it is perfectly acceptable to bring a full water bladder and a water bottle. Sturdy shoes – Unless we mentioned otherwise, most hikes in Park City are fairly mountainous with dirt tracks and loose rocks. It’s not a bad idea to carry flip-flops if you are hiking to a lake, but we do not recommend you attempt most of these hikes in flimsy shoes. Waterproof windbreaker – The weather in the Wasatch Mountains can be highly unpredictable, going from sunny and warm to surprise cloudburst. A lightweight, waterproof windbreaker often is enough to shield you from any weather surprises. Poles – Some trails won’t require hiking poles. But if you struggle a bit with steadiness on your feet, a pair of hiking poles can be helpful on the more rugged trails. First-aid kit – There are tiny first-aid kits you can pick up and easily throw into a backpack or running belt. If you want to compile your own, include a few band-aids of various sizes, disinfecting wipes, and antibiotic ointment. Wildlife – As Park City is a small town nestled right in the heart of the mountains, you will have the opportunity to see plenty of wildlife on your hikes. Please do not feed any wildlife; instead, simply enjoy seeing the animals in their natural habitat. Moose can potentially be dangerous, so be sure to give them a wide berth. There are also the occasional black bear sightings. 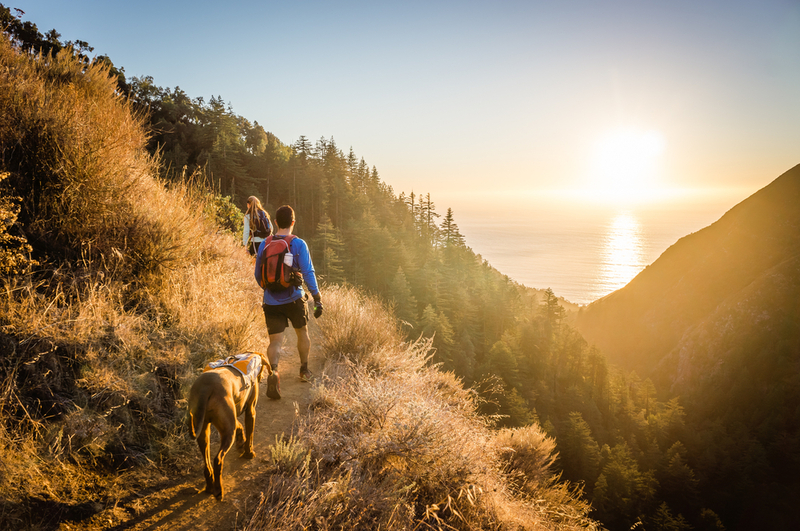 Pack out any food you bring in and be extra alert when hiking at dawn and dusk. Seasonal warnings – Flash floods, avalanches, forest fires, and other mountain hazards apply to Park City, like any other mountainous area. Keep an eye on the Park City weather advisories to make sure you stay safe as you hike. Loose rocks – Aside from the paved trails, you are going to encounter loose rocks as you hike. This presents not only a footing hazard for you but a potential falling rock hazard if you are going up switchbacks. Listen for any sounds which may indicate that rocks may be falling toward you. Other activities – Hikers are not the only ones who love the trails in Park City. Many mountain bikers also love to challenge themselves on these trails and are not always prepared to encounter a hiker. There are also often families, off-leash dogs, parents with strollers and people using assistive devices. There are plenty of resorts, hotels, and short-term vacation rentals you can stay at when visiting Park City. But, if you find you have fallen in love with Park City and want to set up a more permanent vacation home, Jensen and Company can help you. Brad Jensen has been working in real estate in Park City for decades and has helped hundreds of people find the home of their dreams. If you are interested in real estate in Park City and the surrounding private communities, contact us to start working with Brad today.